The transition into healthier eating can seem difficult — even impossible — but there are plenty of small changes to make it more feasible. Just like Bill Murray in “What About Bob,” do it in little baby steps. The following 7 tips have not only been shown to encourage you to make healthier choices, but they can also help you to overeat less often. Hide your cereals. Yes, even your healthiest granolas. 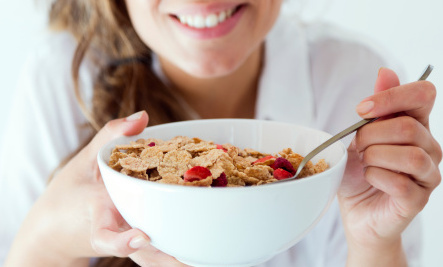 According to Cornell food psychologist Brian Wansink, those who keep their breakfast cereals on the counter or in view weigh 21 pounds more on average than those who keep their cereals out of sight. Pre-plate your food. Instead of serving everything buffet style at the table, try pre-plating your foods in the kitchen. Not only is this more aesthetically pleasing to the eyes, but it also has been shown to help people eat an average of 19% less food at mealtimes in Wansink’s research. Color coordinate your plating. Speaking of aesthetics, the way your food visually appears can greatly influence how much you indulge. Beautifully plated food can make the eater more satisfied and less likely to overeat, so get creative! Also, when the color of your food is in contrast to the hue of your plates, you are also less likely to overeat. Those who consume foods that match their plates have been shown to eat 22% more food than those eating off of contrasting plates. Set down your drink. By setting down your wine in between sips, you may inadvertently drink 12% less. This goes for any liquids, especially occasional sugary indulgences like sodas. Also, choosing tall, thin glasses instead of short, stout ones, you may be more satisfied with less calorie-dense liquid. Ask ‘What would Batman choose?’ Or, superhero of your choice… or Ryan Gosling, I suppose. Thinking about what food another person would likely choose or encourage may influence you to choose the healthier of two options. By thinking outside yourself you are actually more likely to hold yourself realistically accountable for your decisions. Thanks for the help, Mr. Gosling. Chew gum while doing groceries. Grocery shopping while hungry can be a disaster. An hour later you get home with a receipt 2 feet long and a few bags full of nothing but chocolate, sugary cereals, and crackers. To fend off this shopping-hunger-blackout, try chewing mint gum during your weekly market run. It will encourage you to buy less junk food — although some discipline is necessary alongside. Bag your lunch. Not only will it allow you to maintain complete control over what is going in to your body, but you’re also less likely to overeat when bagging a lunch. Restaurants often serve oversized portions, and if you are at work you may be disinclined to take some back to the office in a doggie bag. A great idea is to make a big batch of food on Sunday and dole it out in little glass containers for the week. That way, there is no morning rush and you get a delicious and nutritious lunch. Mindless eating can be an easy trap in which to fall. By getting in the habit of eating more mindfully — chewing and tasting slowly and thoughtfully — you can drastically reduce your consumption of excess calories without much mental effort on your part. In the meantime, check out more of Wansink’s advice over at mindlesseating.org.